At today's WWDC keynote event, Apple offered a sneak peek of its next-generation Mac Pro, a line of desktop computers that has not received a significant update in several years. The preview began with a teaser video showcasing the radically redesigned tubular tower. 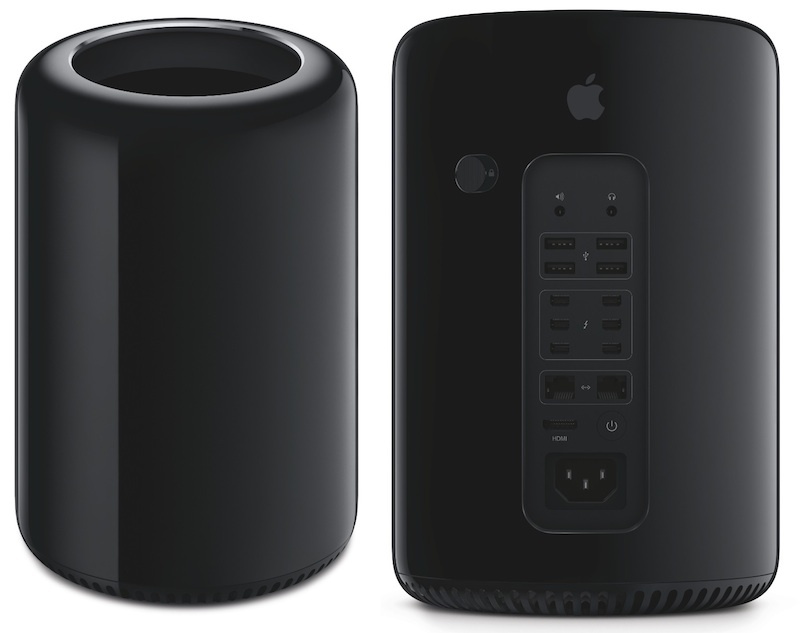 The next generation Mac Pro is architected around an ingenious unified thermal core that allows the desktop to efficiently share its entire thermal capacity across all the processors. The result is a pro desktop with breakthrough performance packed into a design that is one-eighth the volume of the current Mac Pro. Next generation Intel Xeon E5 processors with up to 12 core configurations deliver double the floating point performance. With two AMD FirePro workstation-class GPUs, the all-new Mac Pro is up to 2.5 times faster than the current Mac Pro and delivers up to an amazing 7 teraflops of compute power. The new Mac Pro also features PCIe-based flash storage that is up to 10 times faster than conventional desktop hard drives and includes the latest four-channel ECC DDR3 memory running at 1866 MHz to deliver up to 60GBps of memory bandwidth. With all that power, the new Mac Pro lets you seamlessly edit full-resolution 4K video while simultaneously rendering effects in the background. New generation Intel Xeon processors, ECC memory, and new PCIe flash storage will debut in the new Mac Pro. External expansion will be available via six Thunderbolt 2 ports and graphics will be handled by dual workstation AMD FirePro GPUs with support for up to three 4K displays. 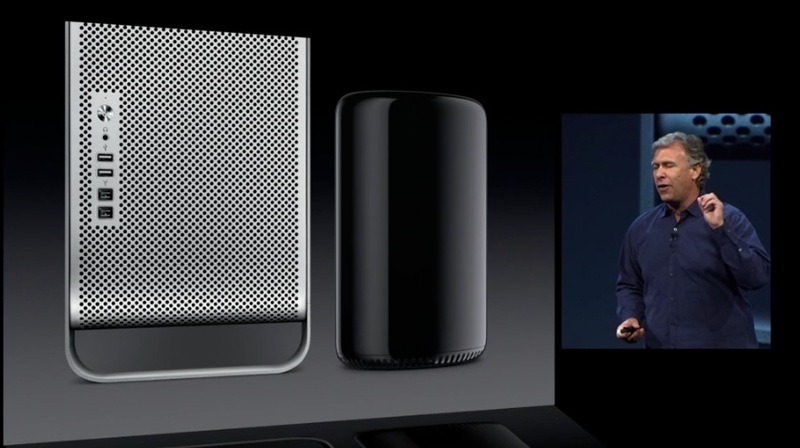 Compared to the previous Mac Pro, the next-generation model is approximately 1/8 the size. The new Mac Pro will also be assembled in the United States. A special WWDC session tomorrow will see representatives of The Foundry and Pixar showing off how The Foundry's MARI 3D digital paint tool can take advantage of the upcoming Mac Pro hardware. It looks amazing. I want it now. Apple does update Mac Pro, Macrumors users complain. I've been waiting silently to see what they've been teasing at for so long now. I thought for sure that with Steve gone, they'd finally release a modest, modular "xMac" after all these years. Instead, they release a MacMini Pro. For years, I've been hoping for a simple desktop from Apple that would grow with my needs. I've never needed a workstation, but occasionally I like to replace my graphics card, or throw in an extra hard drive. I've needed a Mac Pro Lite. Apple consistently refused to deliver. I've tried hackintoshes for the past 8 years, but they're always too much work to maintain, and too unstable. Eventually I just gave up. And I didn't end up settling for an iMac, a Mac Pro, or a Mac Mini. After DECADES of being an Apple fanboy - believing in the company when no one else did (much to the ridicule of all my friends) - Apple has made a Windows user out of me. I would've never believed it to be possible. Hate on me all you want. You are no longer my people. I wish they would have used the old design. I see no room for expanding hard drive space and I'm curious if the GPU will be upgradable. Is there actually a one pro user on this thread? a unified system handling 4K out of the box is... an issue? a problem? too costly? plastic? looks like a trash can (that takes the suburban cherry award)? Can't stick in those POS buggy cards mom gave you money for? WTF, who are you people?